Oh glorious days! When was the last time we had a whole weekend of gorgeous weather? After eight straight months of snow, it was just awesome to make it through May without any icy accumulation – unless you count those hail storms from a couple weeks back. But that’s all over, and we had a whole weekend of sun for baseball (Clippers double header, Indians sweep!). Hell, even the Memorial golf tournament enjoyed perhaps the best weather in its history. It was like a whole weekend needed some kind of announcer to color commentate. It all put us in the mind of some of our favorite onscreen sports announcers. Christopher Guest’s drolly hilarious send up of dog culture gets, as is so often the case, splashes of lunacy from Fred Willard. In this case, his ignoramus color commentary during the Mayflower Kennel Dog Club Show opposite the perfectly dry Jim Paddock punctures the proceedings perfectly. As famed sports announcer and voice of the Dodgers Red Barber, McGinley had big shoes to fill. His spot-on delivery added to the historical context 42 was hoping to articulate, and also pointed to Barber as an unflappable pro with a sense of humor and a fluid, soothing delivery. 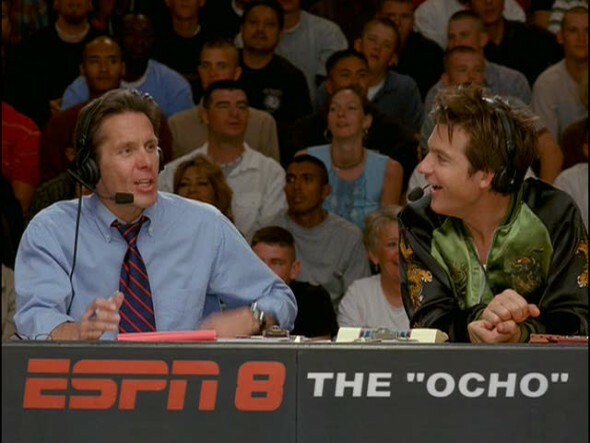 The Dodgeball straight man/color commentary duo of Cotton McKnight (Cole) and Pepper Brooks (Bateman) from ESPN 8: The Ocho brought that classic bout of titans the gravitas it deserved. Bateman’s as over-the-top as he has ever been in his career, and consummate pro Cole hits dead pan gold as the play by play. If there is one thing that makes Major League a timeless classic (it is, too! ), it’s Bob Uecker’s hilarious play by play announcer. Fed up, feisty and probably drunk, his Harry Doyle kept the film’s pace high and the laughs continuous. ‘It’s in the hole!” Proving that he can do anything at all, Bill Murray puts tears in our eyes as assistant greenskeeper Carl Spackler, imagining his own Cinderella story of coming out of nowhere to win the Masters. Weekend Countdown: Let’s Go Jackets!